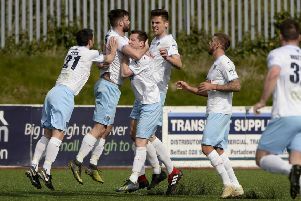 Harryville Homers and Carniny Rangers kept alive hopes of a remarkable all-Ballymena Irish Junior Cup final at the weekend. The two firmus energy BSML rivals came through their quarter-finals to book places in the semi-finals of the Province’s Blue Riband junior competition. They are joined in the last four of the competition by St Luke’s and Rosemount Rec - the team beaten by Homers in last seasons’ final - and if they can avoid each other in this week’s draw, the possibility of the showpiece game in Northern Ireland junior football circles could be on the cards. Killen Rangers 1, Carniny Rangers 3: Carniny edged ahead after 11 minutes when pacy Dean Wright latched on to a long clearance and put Carniny ahead with a composed left foot shot from ten yards. The home side worked their way back into the game on 35 minutes with the Carniny back line failing to react quickly enough to clear the ball and Ryan Philips was on hand to touch the ball in after good work by Jamie Sproule. Carniny regained the lead on 49 minutes when Alan Norton, upfield for a corner, received the ball in the box with his back to goal and spun and hit a shot to the bottom corner of the net from eight yards. Killen were almost on terms instantly when skipper Graham Young’s shot from distance struck the post, Andy Crawford was first to the rebound but could only hit the woodwork too. On 53 minutes Alan Norton won the ball in his own half and fed the ball to Frazer Young in midfield. Young found Ryan Balmer bursting down the left and his drilled cross was finished off by Dean Wright to make it 3-1. The home side’s best effort of the second half came once again from Graham Young, moving in from the left the Killen midfielder struck a superb shot which looked goalbound until Sean Ward’s full length dive saw the ball pushed round the post. Harryville Homers 2 Cumann Spoirt An Phobail 1: Holders Homers narrowly overcome the conquerors of BSML rivals Ahoghill Thistle, to make it into their fourth successive semi final in the Junior Cup and keeps them on course for a fantastic double of Junior Cup and Shield. Homers were on the front foot from the start and got the breakthrough on nine minutes. Alan Rainey drove at the CSP defence before being fouled just outside the box. Ryan Stewart stepped up and fired the free kick low into the bottom corner to give his side the lead. Midway through the half Homers were dealt a blow when they lost Captain Ian Russell to injury and this meant a re-shuffle with Richard Reid slotting in at the back, but this didn’t hinder Homers as they doubled their lead six minutes before the break. Alex McCosh’s punt up field was flicked on by Gary Bonnes and found David McWhirter who outmuscled his marker before firing into the bottom corner. The visitiors set up a tense finish when they got a goal back with 15 minutes to go to make it 2-1. CSP almost snatched a late equaliser when they were awarded a free kick on the edge of the Homers box, but keeper Alex McCosh dived at full length to save and held the shot to keep the Belfast side out. Raceview 1, All Saints OB 6: Saints opened the scoring on nine minutes when Liam Cassley showed great trickery in the box and was fouled. Peter McReynolds stepped up and made no mistake from the spot. Saints got the second goal their play deserved when a great flick from Aaron Wilkinson set up Peter McReynolds who controlled brilliantly before slotting past Ian Watt. Saints continued their dominance in the second half and made it 3-0 four minutes into the half when Aaron Wilkinson laid the ball off to Peter McReynolds and he placed the ball in the corner of the net to complete his hat trick. Liam Cassley then had a couple of chances to make it 4-0 before he eventually got his name on the score sheet halfway through the half. Michael McCarry played in Philip Lynn on the right and he squared for Liam Cassley to fire home. Raceview got a goal back with 10 minutes to go when Mark Watson found the net from 20 yards out. This got seemed to kick Saints into life again and they made it 5-1 with eight minutes to go with a great team move. Aidan O’Kane fed the ball into Aaron Wilkinson who laid off to Joe Scullion and he slipped in Aaron Wilkinson to square to Stephen Sexton to smash home. Joe Scullion rounded off the scoring with three minutes to go when he latched onto a Stephen Sexton through ball to make it 6-1. Templepatrick 1, Carniny Youth & Amateurs 5: After a scoreless first half, Carn iny took the lead eight minutes into the second half when Shane McWilliams crossed in from the right from Adam Heron to net to give the visitors the lead. Seven minutes later it was substitute Barry Simpson who weaved his way through the defence to score after receiving from a Tyler McAuley cross before Templepatrick pulled a goal back. This was short lived however when the energetic pairing of McAuley and Simpson combined once again for the latter to score his second and Carniny’s third. Top goal scorer Scott Buxton then got in on the act when he burst in from the left to net Carniny’s fourth. McAuley then turned provider for Buxton to net again from close range. Rainey Cup, round one: Cushendall 2, Waveney Swifts 2 (Waveney won 6-5 on penalties). Rainey Cup, round two: FC Penarol 2, Abbeyview 5; Northend & District 1, Glenravel 4; Seven Towers 0, Ahoghill Rovers 2.
firmus energy Division One: Ahoghill Thistle 2, Newpark Olympic 1; Ballykeel 0, Clough Rangers 6.
firmus energy Division Three: St Comgalls 4, Rubys Rovers 1; Steadfast 0, Braid United 3; Wakehurst Star 0, Atletico Antrim 5. Saturday, March 5 - Toals County Antrim Shield, round five (1.30pm): Greenisland v Harryville Homers. Rainey Cup, round two (10.15am): Southside Rangers v Holywell (Wakehurst 1); Michelin v Carnlough Swifts; Galgorm Blues v Cloughmills (Galgorm); Wakehurst Star v Sporting Ballymoney (Showgrounds 4). Ace Cup, round one: Abbeyview v FC Moylena (Forum). firmus energy Division One: All Saints OB v Ahoghill Thistle (Showgrounds 5); Glenravel v Clough Rangers (Cargan); Newpark Olympic v Carniny Rangers; Raceview v Ballykeel (Broughshane). firmus energy Division Two: Ahoghill Rovers v Seven Towers (Ahoghill); Randalstown v Woodside; Waveney Swifts v FC Penarol (Waveney 2). CGRSC Sammy Moore Cup, second round, first leg: Carniny Amateurs & Youth v Steadfast (Showgrounds 7); Templepatrick v Northend & District (Forum). firmus energy Division Three: Cullybackey Olympic v St Comgalls (Tober Park).